Docking is the process of attaching one ship to another entity in StarMade. Docked ships gain various benefits such as sharing power, shielding, and even homebase invulnerability. Docking is an essential part of StarMade's core gameplay. Any Ship Core driven entity has the capacity to be attached to another entity be it a Space Station, Asteroid, or even another Ship. Players can also attach any number of ships on to each other creating massive chain docks. All docking in the game requires the use of the Rail Docker and the various rail blocks. 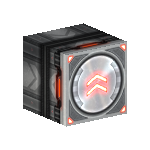 Using the Rail system players are able to not only create static docks for their ships but also fully mobile platforms. Ships docked to a rail network will move accordingly depending on the type of rail block used and its direction. Logic Signals are used to control the movement in a rail network. Docking a ship to a Faction Home base will make it completely invincible and access restricted keeping it safe while you are away. When a ship has been successfully docked most of its deactivate as they become a part of the parent entity's power system. Docked entities are completely relent on their parent entity's for power generation. It is advised that if players intend to have many turrets on their ships that they design their power systems accordingly. If the rail block that is connecting a docked entity to its parent entity gets destroyed then the docked entity will no longer siphons energy also though it will still remained docked. Shields on docked entities also deactivate making docked entities dependent on the shield placements on their parent entity for protection. In larger fights going after a ships turrets can be a very high priority as they are simultaneously a ships strongest and weakest points. One of the only systems that a docked entity shares with its parent is thrust. Clever shipwrights should stacks Thruster Modules into their Turrets to subtly increased the speed of the larger ships they will be attached to. The basic operation of a docking system requires a ship fitted with a Rail Docker, and a target ship, with at least one accessible Rail Basic, Rail Rotator, or Rail Turret Axis. On board the docking ship, the Rail Docker must be placed on the hotbar by opening the Weapons Menu (G) and dragging the desired Rail Docker's icon into a hotbar slot. Then, the pilot must select the Rail Docker in the hotbar and fire it at the desired rail block on the target ship. A Rail Docker fires a beam over a relatively short range, and can be difficult to aim if the viewpoint is offset from the Z-axis of the docker itself. For greatest ease of aiming, a Camera should be placed directly behind, or in front of, the docker. 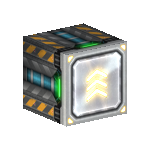 In StarMade, static docking and linear movement can both be done with a single type of block, the Rail Basic. If you wish to create a static dock where a docked ship does not move then all that is needed is to place a single Rail basic down in the desired direction and orientation. When a ship docks to this rail basic it will snap into place and in the direction that the arrow on the rail basic is facing. It is also advised that when creating static docks you make the appropriate space for it. Prospective docking ships will calculate if there is enough clearance before teleporting into place. If there is no room to dock then the docking ship will receive an error message. While docked entities will remain still when docked to a solitary Rail Basic if there is several rail basics place adjacent to each other then linear movement will occur. In rail movement a ship will slowly move across the face of a rail block. The direction in which a ship will move is determined again by the arrow on its "face". A docked ship will continue to move in a given direction so long as the rails it is moving across all point in the same direction. If a rail block happens to face a different direction then the rail entity will "hop" its tracks and change course. Through the use of logic rail movement can be manipulated in more advanced ways such as instant directional changes as well as full stops. Along with linear movement the rail system also allows docked ships to be rotated in different directions. The Rail Rotator Clock Wise and Rail Rotator Counter Clock Wise blocks are both used to rotate docked entities. Other than that both blocks function identically to each other. The "face" features two sets of arrows, A large central one and a directional quarter circle one. The central arrow much like the Rail Basic determines both the docking and linear movement direction. The quarter circular arrow indicates the direction in which a rail entity will turn. When used on their own the rotators will automatically turn a docked ship in its indicated direction. If used in conjunction with Rail Basics it will first initiate its turn then move the docked ship in its linear movement direction (provided there is another rail block for it to move to). 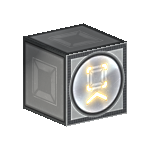 Rotator blocks make more extensive use of logic then their rail basic cousins. If you were to connect Activation Modules to a rotator rail then you can determine the rotational degree in which that rotator will turn. The act of turn on the Activation Modules will determine the total rotational degree of the next turn. Rotational degrees can be changed in 45 degrees at a time. With 8 activated Activation Modules a rotator will do a complete 360 degree turn. Connecting a 9th Activation Module will make the next turn infinite. Use this method to create infinity spinning rail creations. Turrets can also created using docking but are less straight forward in their construction. They require the use of the Rail Turret Axis block. The Arrow on the block's "Face" only determines the docking direction and does not make a ship move at all. Once a ship has docked to a Rail Turret Axis it will have full 360 degree rotational movement, unlike Rail Rotators which require the use of logic and Activation Modules in its activation. However one docked ship will only allow for rotation on just one axis. In order to enable a turret to track targets along another axis you will need to dock another ship onto the first. The first ship that you dock will be considered the "Base" while the second one acts as the "Barrel". 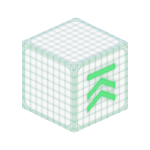 The AI for turrets currently only takes advantage of two axes: The Horizontal (X-axis) and the Vertical (Y-axis). A turret will only take advantage of both axis's as long as there is one ship rotates along both axes. Whether the base or the barrel rotates along the x-axis doesn't matter as long as the other ship rotates along the y-axis. Finally the Barrel ship is the primary ship on a turret. When you activate the AI on the barrel it will control the base in order to allow more range of movement. The Barrel is also most likely where you will put all of your weapon systems. There is (Currently?) no way for the base to share weapons and systems with the barrel. Fleets are special groupings of ships that players can designate to do a variety of tasks. One such benefit of fleets is the ability to create functioning carrier ships. These carrier ships make use of several intangible docking blocks in order to launch and recall fighters as well as moving them into their docks without physical rail contact. Fleet docking blocks are naturally invisible in flight mode and can only be seen in build mode. All fleet docking blocks are also intangible meaning that players can fly through them. However they also count as a part of your ship and can trigger shields and be destroyed like any other block. The First of these blocks is the Pickup Rail. The pickup rail functions exactly like its physical counterpart the Rail Basic but with the added benefit of allowing docked entities to pass through it. These are mainly used to move fleet ships to their receptive docks on a carrier. 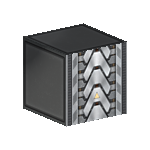 They are also used in conjunction to the Pickup Point which is a unique block that acts as an auto docking point for any ship whose Rail Docker gets within 3 meters of it. They also work as a recall point for a ship's AI when in a fleet. The last fleet docking block is the Shootout Rail. This block is similar to the pickup rail but with the ability to launch docked entities from it like a real world aircraft carrier. Through the use of the rail system players can transfer items between entities. The Cargo rails, in terms of rail movement, function identically to the Rail Basic. They allow linear movement only while also being useful for static docks. Where cargo rails differ from normal rails is in their item transfer ability. Depending on which rail is in use items can either be pulled from a docked entity or pushed on to it provided the proper permissions have been given. The system also requires at least one Storage block connected to these blocks. Cargo rails will pull/push items from all connected Storage blocks. Permissions settings can be found in the ship radial menu (Tab). The Rail Load block allows a parent entity to transfer items onto a ship that has docked to it. Ships that docked to it (with permission and an active storage block) will begin to pull items from any storage block that is currently connected to it. The Rail Unload does the opposite. Ships that dock to it will (with permission and an active storage block) push items from its cargo system to the parent entity. It should also be noted that in order for items to successfully transfer over each storage block must have the proper filters set. This page was last edited on 5 November 2018, at 18:15.